Annual or perennial herbs, rather rarely with woody perennial culms (subfamily Bambusoideae); hollow or solid, septate at the nodes. Leaves two-ranked, consisting of the sheaths, ligules and the blades. Leaf-blades mostly linear and not petiolate at base, rarely with broad blades and stipitate at base (subfamily Bambusoideae); ligules membranous or ciliate, rarely lacking (Echinochloa), leaf-sheaths clothed at the internodes. Flowers bisexual or occasionally unisexual, without distinct perianth, it representing by 2 or 3 small scales, the lodicules, rarely six or sometimes absent; stamen mostly 3, rarely variable numbers, with filiform filaments and 2-celled anthers; pistil 1, ovary 1-loculed, containg 1 anatropous ovule, the style with plumose stigmas. Fruit mostly a caryopsis with rich endosperm, the embryo at the base opposite to punctiform or linear hilum which facing the palea. 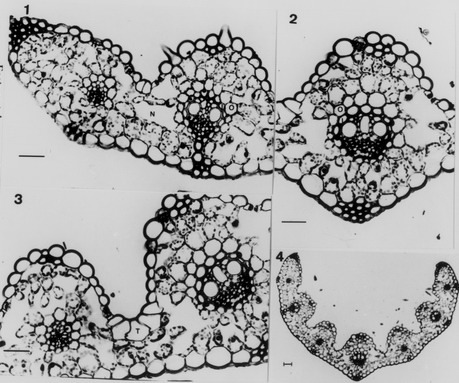 Flowers sessile between abaxial lemma and adaxial palea, constituting a floret. One to many florets dispoded alternatly on the oppostie sides of rachilla, in addition with a pair of empty glumes at the base forming a spikelet. Inflorescence with spikelets as an unit aggregate into panicle, raceme or spikes. Hsu(1974) treated 5 subfamilies (excluding Bambusoideae), 27 tribes, 118 genera, 289 species, 1 subspecies, 39 varieties, and 8 forms in Taiwan.